Though Amazon hasn’t announced anything officially and denied to comment, it’s being reported that Sam Strike and Jasper Pääkkönen have been cast in the series. 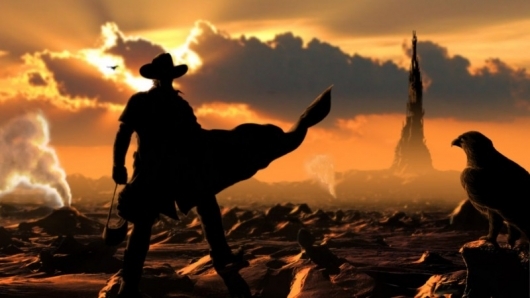 According to the report Strike will play the Gunslinger, Roland Deschain; while Pääkkönen will play his adversary the Man in Black, who is also goes by Randall Flagg and other names. Idris Elba played the Gunslinger in the 2017 movie adaptation, with Matthew McConaughey playing the Man in Black. Strike’s credits include EastEnders, The Texas Chainsaw Massacre prequel Leatherface, the short-lived adaptation of George R.R. Martin’s Nightflyers on SYFY, and David Fincher’s Mindhunters. He also has a role in Chernobyl, an upcoming HBO miniseries. Pääkkönen recently starred in Spike Lee’s BlacKkKlansman, and will star in Lee’s next project Da 5 Bloods as well. He also had a role on the TV series Vikings alongside Katheryn Winnick, who starred in the movie take on The Dark Tower as Laurie. The report says that now that the two leads have been cast, an official pilot order could soon follow.